We welcome your use and enjoyment of the reserves at your own risk. 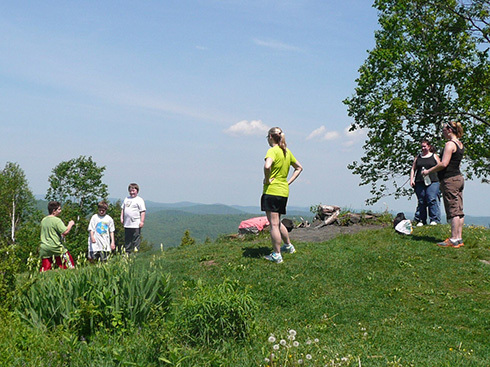 Our Association mission is “to acquire, conserve, and/or make accessible the lands along the Windmill Ridge and nearby areas.” Reserves now include Bald Hill in Westminster, and the Athens Dome area in Athens and Grafton. To reserve the shelter at the Pinnacle call 802-463-9226. DOGS are permitted on the trails (excluding the Martin Wildlife Sanctuary). Owners are responsible for control by a leash. TRAILS ARE DESIGNED AS FOOTPATHS. Horses, wheelchairs, bikes, and skiers may encounter unsuitable terrain in some sections. Mountain bikes and horses are permitted on the trails, but please do not use them during wet periods. MOTORIZED VEHICLES are not permitted in the reserves (except for emergencies and authorized maintenance activities). SNOWMOBILES are permitted on the Association-owned section of Miller Road in Athens connecting with Old Athens Road in Westminster, and the VAST trails in Grafton and Rockingham. WHEELCHAIRS are allowed, but beware of the rocky, steep terrain. Caution is advised. Handicapped individuals may use motorized vehicles only on the Paul’s Ledges access road. For a key to that gate call 802-869-1388. PLEASE STAY ON THE TRAILS so as to minimize disturbance of the plants, animals, and cultural artifacts. The use of metal detectors and removal of artifacts are prohibited. IMPACT. Please observe a strict low-impact, carry-in/carry-out, leave-no-trace policy. GROUPS. A responsible adult must accompany groups of children. Groups of 12 or more require prior authorization from the Association: 802-387-6650. OUTDOOR FIRE is permitted upon request only at the Pinnacle (the peak) itself, with prior authorization from a Westminster Town Fire Warden. People must carry in their own firewood. Call 802-387-5778 or 802-722-3178 or 802-463-9355. HUNTING is permitted throughout the reserves except in the Stephen Martin Memorial Wildlife Sanctuary and the Bald Hill Reserve. QUESTIONS? Do not hesitate to call us: 802-869-1681. Overnight use of the Pinnacle shelter is permitted for a maximum two-night stay. A reservation is required. Call 802-463-9226. We request that overnight guests make a suggested per-night donation of $5 per person or $20 for a family of four or more. We ask that you pay in advance, if possible, by credit card or that you leave a check or cash in the Iron Ranger upon arrival. Those donations will help to keep the Pinnacle cabin safe and inviting. Or click here to print & mail a donation. Handicapped individuals may use wheelchairs on our trails. Our trails are fairly rugged, often steep, with numerous waterbars, rocks, and other obstacles. Wheelchair users will need to use caution as our trail system has trail-design limitations that may affect user safety. Please see detailed information on trail kiosks. 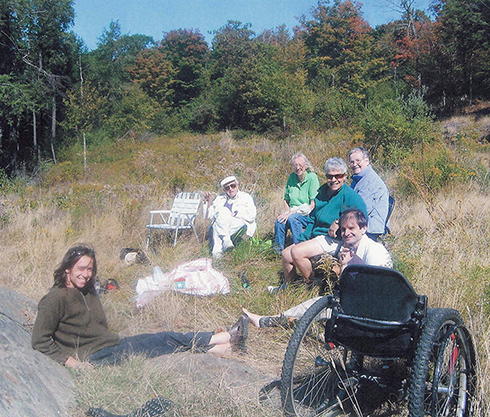 Handicapped individuals may use motorized vehicles only on the Paul's Ledges access road. Users will need to call 802-869-1388 for a key to the gate. All other trails are restricted from any powered-vehicle use by all individuals (whether handicapped or not). Please see detailed information on trail kiosks. Note: These special Wildlife Sanctuary regulations are of necessity considerably more stringent than those applicable to the remainder of the Windmill Hill Ridge Nature Reserve and other Pinnacle reserve trail systems. Please stay on the trails to minimize disturbance of the plants and animals. No bicycles or mechanized vehicles of any kind. No dogs (except service dogs), horses, pack animals, other livestock, or pets. No removal of any game, wildlife, or plant, dead or alive. No use of metal detectors or removal of artifacts. Please observe a strict low-impact, carry-in/carry-out, leave-no-trace policy to help us keep the Sanctuary pristine. 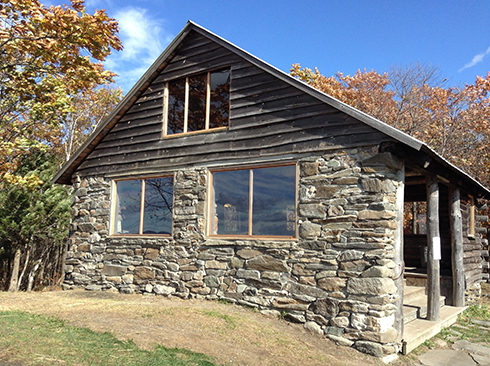 The Pinnacle Cabin, renovated in 2016, showing its new west wall and windows. 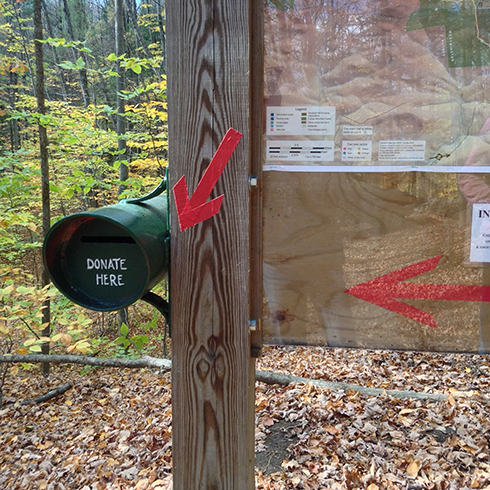 The Iron Ranger for donations is located at the left side of the Holden Trail kiosk. It is the handiwork of Joe Richards, 2016 Pinnacle Volunteer of the Year.